On the face of it, remembering all the number combinations that add up to ten shouldn’t really be that hard. 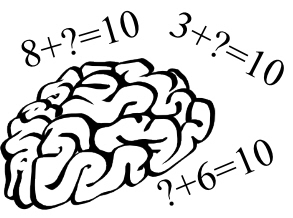 But for a child with dyspraxia or dyscalculia (or both), how do you get those numbers to stick? “The lock that keeps numbers in my brain,” she replied, bashing her forehead with her fingers. What’s the Point of Number Bonds? This is actually an area of maths that I can see the point of learning. It’s useful to remember these little sums at this stage so maths down the line is easier. Further on in their maths learning, they can even reverse the pairs and use them for subtraction too. So your child will know that 6+4=10, but that also means that 10-4=6. These numbers are pairs, and it really does make sense to learn them. Unsurprisingly, I’m going to recommend that fun learning is the way to start. 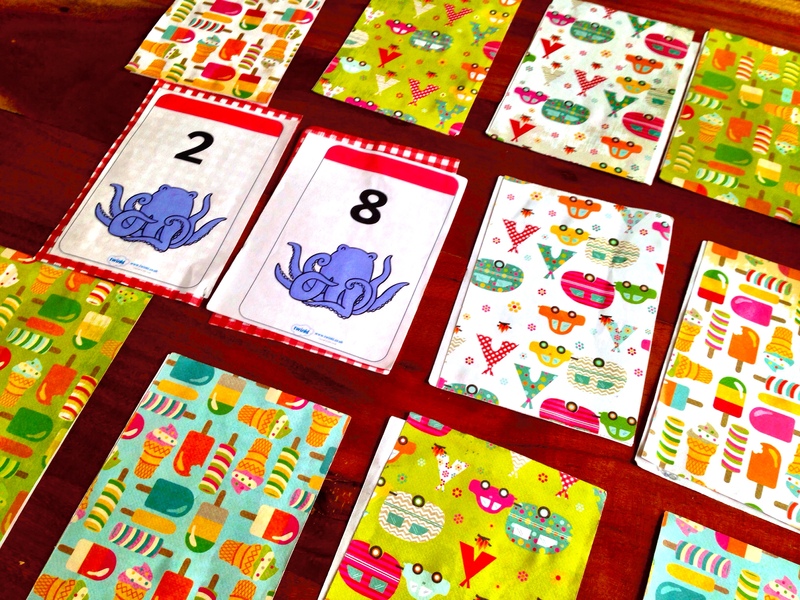 The best game I’ve found to lock in those number bonds to ten is the pairs game. 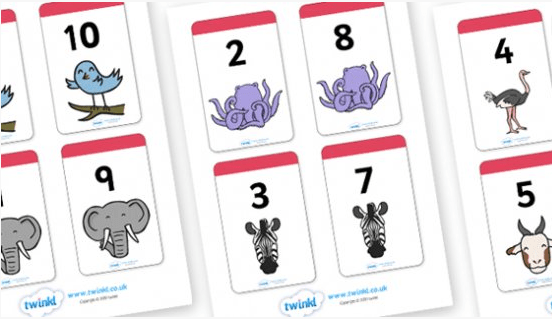 Take a look at Twinkl or Mathsticks for some great resources of printing out pairs cards. We started out with the Twinkl ones that are animals. The reason I recommend these (although there are loads of different options), is that the relevant pairs are the same animal. I’ve found this makes a huge difference in how the numbers are remembered. But whichever ones you choose, make sure they are visual–not just numbers–as this really helps our little guys to remember. Dyspraxics are visual learners. Play a game of pairs and don’t worry if you can see the printing through the other side of the paper. Eventually, although it seems like your child is ‘cheating’ by looking through the paper, it means they know which animal or character they are looking for. For a start they will just be matching up the animal and the numbers will be secondary, but with repetition, these numbers will start to stick. Play this game everyday for a few times a day. When they start to remember them, then you can think about backing the cards so they can’t see through them. You can now move on to different games to make things more interesting and to see if the information is sticking. Hit the Button – it’s quick fire but fun, and often the first instinct is the correct one so there’s not minutes going by while your child squirms over the answer. Save the Whale – less pressure than Hit the Button and gives a more visual representation of the different ways to make 10. 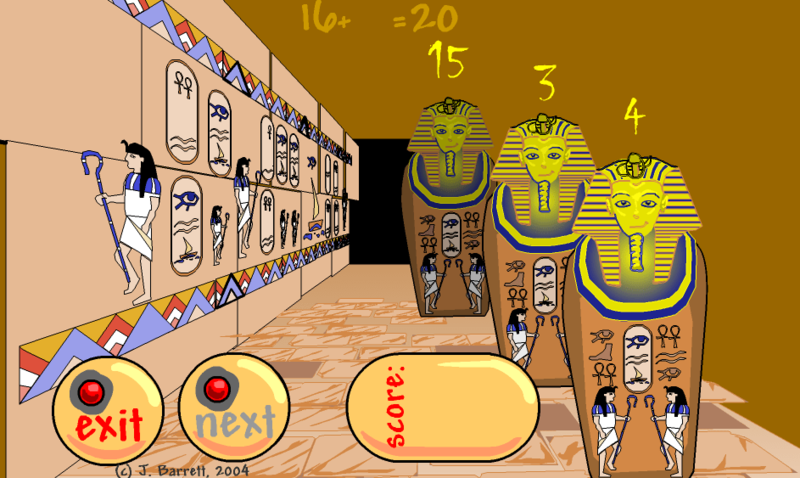 Funky Mummy is great for when you move on to number bonds to 20. Really impress the teacher by making your own number bonds worksheets and getting your child to fill in the gaps. This is more like the kind of thing they do at school and your child’s confidence will be really high by now. 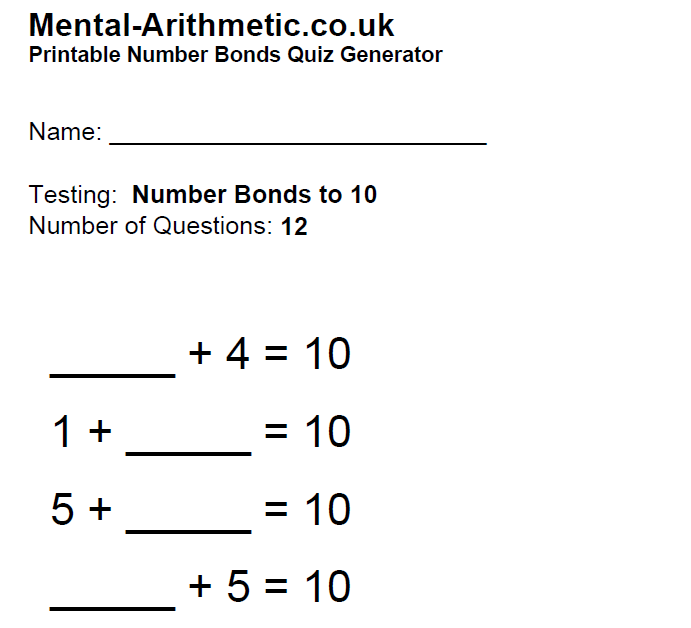 I really like the Mental Arithmetic site for worksheets as you can choose how many questions and what number bonds you are working on, and it generates a worksheet randomly, so it will be different next time. 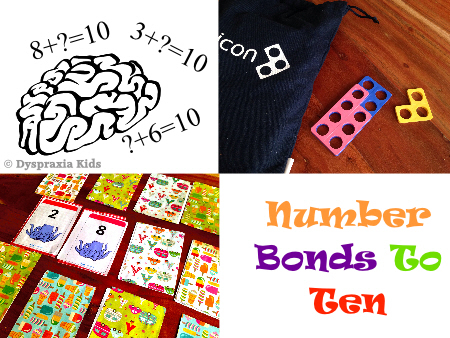 Another way of helping your child to remember number bonds to 10 is by using Numicon. If the pairs game isn’t working for your child then it’s possible that using colour will help them instead. Numicon is widely used in most primary schools in the UK and there is now a homework set that you can buy for home–the full set that schools have is super expensive! We bought our Numicon set from Amazon for about £17 but prices go up and down. Numicon is useful for more than number bonds though, so I highly recommend it. One great Numicon game is that you put the 10 shape on the table, and then a mix of all other numbers in the feely bag. Get your child to pull out one of the numbers and put it on top of the 10 shape. Can they figure out what number they need to make 10 by looking at the empty space that’s left? I also printed out this Numicon representation of number bonds and stuck it on my daughter’s bedroom wall. Once your child has mastered number bonds 10 then you know what’s next? Yep, number bonds to 20! I’m not going to do a separate article on that as the principle on learning is the same. In fact, number bonds to 20 should now be easier as you really just remember the number bonds to 10 and either eliminate or add a ‘1’ at the front of the number. So, your child knows that 5+5=10, so 5+?=20. As 5 is a small number, they will learn that its pair is a high number, so the missing number must be 15. Do you ‘like’ our Facebook page? We have tips and articles everyday to help our dyspraxic kids.